In its first and only game of the year under the lights, men’s lacrosse took on another rookie program Tuesday night, routing the University of Massachusetts at Lowell 18-9. In a predictable win over the fresh-faced River Hawks — who just ended their first Division I season at 1-12 overall — the Big Green earned its most decisive victory of the season, putting itself over its previous season high of 16 goals in a game. The game also marked the first time the team came away with a victory of more than two goals. In a conscious effort to get more marks on the board, Dartmouth put up 41 shots, raising its shots per game average on the season to 30.8. The Big Green began the match with a slow start, winning the first faceoff but giving up the first goal to UMass sophomore Martin Winter. UMass controlled possession for most of the first quarter, forcing Big Green turnovers with tight defensive pressure. The River Hawk’s goalkeeper, sophomore Alex Desmarais, came up with strong saves on low shots, thwarting several Dartmouth chances early on and finishing the game with eight saves and 11 goals allowed. The first quarter – and the entire game – showed a large amount of sloppy play and was filled with turnovers, with 30 on the night for the Big Green and 28 for UMass. It wasn’t until the last 10 seconds of the first that Cam Lee ’16 put the Big Green on the board, tying the score at 1-1 to end the quarter. Once the whistle blew for the second quarter, the Big Green got hot. Thirteen seconds into the second, Adam Fishman ’15 was on the board, and a minute later Lee had a second marker. UMass got on the board next, but the last six minutes of the first half saw five more goals from Dartmouth, ending the half with an 8-2 lead. By halftime, it looked like the Big Green might have put the game out of reach, but more goals were on tap in the third. 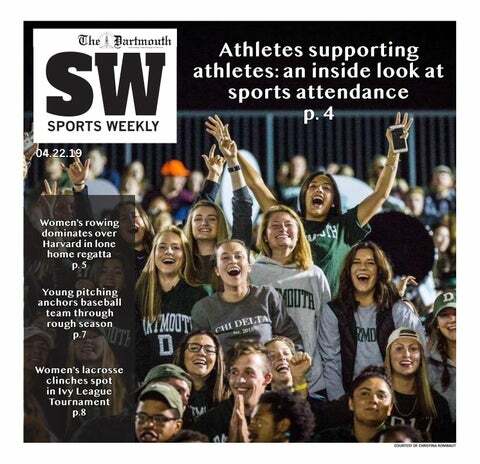 After opening the quarter with a goal once again — this time a ninth-second pitch from Wiley Osborne ’17 — Dartmouth fell into a back-and-forth game with the River Hawks. UMass Lowell pulled some unusual maneuvers in the second half, including removing its goalie from the net and sending a defender with a goalie stick to replace him. “That was the first time I’ve ever seen that as a coach in a Division I game, so it certainly took a little bit of getting used to,” Callahan said. This unconventional strategy allowed the River Hawks to bring out an extra defender for more double teaming and defensive pressure on the ball. The River Hawks were rewarded for their risky, high-pressure strategy, winning the third quarter 5-3 and bringing the game back to a four-goal deficit at an 11-7 Big Green lead. As the night grew darker and the temperature dropped, the score continued to climb. Dartmouth got back on track in the fourth and exploded for seven goals in the final quarter. A standout performance in the X from Hession helped the Big Green maintain control of the game and get the looks it needed to put up 18 goals on the night. Led by Hession, the Big Green won 27 out of 31 faceoffs in the game. Hession attributed his success in the X partially to his successful adaptation to UMass Lowell’s unique three pole formation on the face-off. The men have just one game remaining in the season — a home contest against Brown University on Saturday at 1 p.m. The result will decide Brown’s qualification for the Ivy League tournament, for which Dartmouth is already out of the running. “To knock Brown out of Ivy tournament contention would be awesome to send the seniors out the right way,” Lee said. The lacrosse team has not reached six overall wins and two conferences wins since the 2007-08 season. It has a chance to do so for the first time in eight years this Saturday.